A trip to Norway with Hurtigruten is unlike any other, allowing you to experience 34 ports of call covering the entire coastal route. On your Northern Lights cruise you will get to cross the Arctic Circle, sail past more than 100 fjords and witness the beauty of nearly 1,000 mountains. What’s more, your journey can be as actioned packed as you like, allowing you to get up close and personal with the destination like never before! Hurtigruten will be holding an extensive range of excursions exploring this fantastic region, so you can experience this destination like the locals do. Please note excursions are available at a supplement, subject to availability and may vary depending on the departure date. Mountain Hike In The Hjørundfjord – Discover the beauty of Hjørundfjord on this 2 hour 45 min hike, offering magnificent fjord scenery with a local guide. You will have the chance to explore an abandoned, yet tidy bear cave, a local grocer and you will have the chance to sample the local beer in Urke. Clothes/footwear: Hiking shoes, warm and windproof. Recommended equipment to bring is a backpack, water bottle, extra clothing, camera and sunglasses. 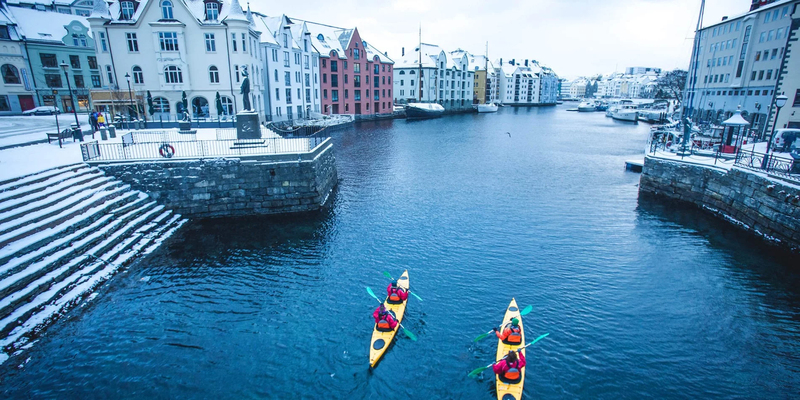 Kayaking in Alesund (2019/20) – Join Huritgruten on a guided Kayak tour through the breath-taking city, Alesund. Discover Ålesund’s Art Nouveau buildings along with the rest of the beauty this city has to offer. Clothes/footwear: Hiking shoes, warm and windproof. Special clothing is provided. 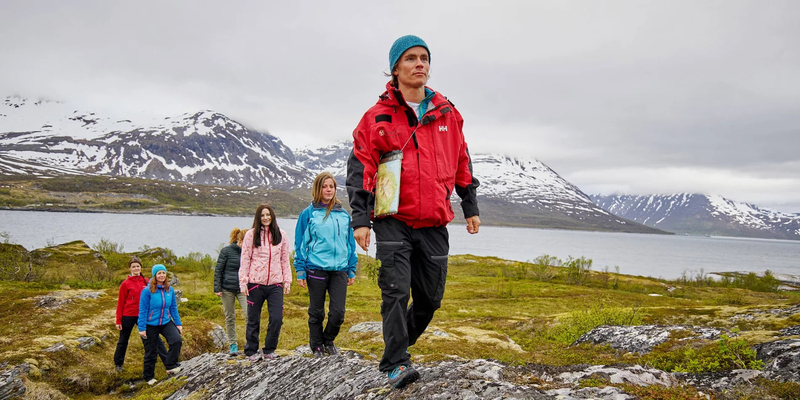 Arctic Coastal Walk in Bodø – Join the Hurtigruten expedition team on a walk along the beautiful coast of Bodø. Get closer to the Arctic nature and learn about the culture and history of this city, including a visit to see Viking graves. Clothes/footwear: Hiking shoes, warm and windproof clothing. Walking sticks are provided when necessary. 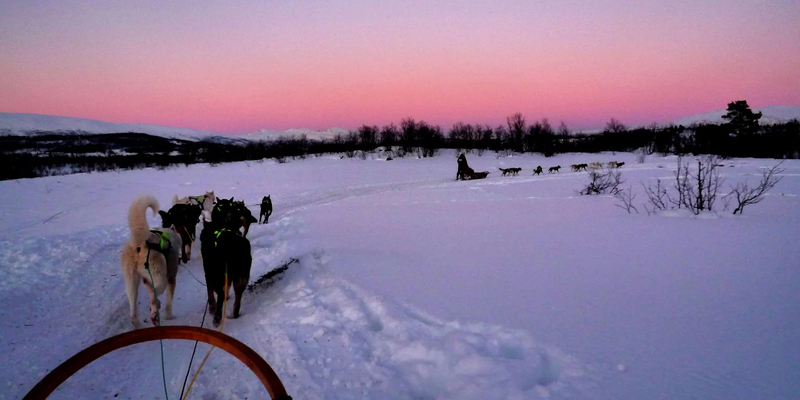 Dog Sledding, Tromsø – Dog sled with huskies while embracing the beautiful scenery of the arctic in Kvaløya just a half-hour away from Tromsø. Clothes/footwear: Comfortable shoes, warm and windproof clothing. Special clothing is provided. 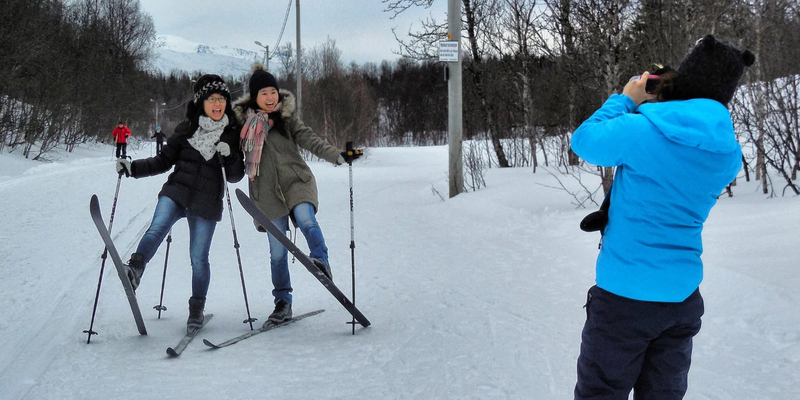 Cross-Country Skiing, Tromsø – Glide through the snow on skis on this fantastic excursion that is perfect for those who are new to skiing or looking to develop their skills. Clothes/footwear: Warm clothes, including a windproof jacket/trousers, hats and mittens. Winter clothing is not included on this excursion. Snowmobile Trip in The Arctic – Join Hurtigruten on an exceptional exciting tour through the mountains from Kjøllefjord to Mehamn. You will receive training from some of Norway’s best snowmobile instructors before you go on the vehicle on your own for this once-in-a-lifetime experience. Clothes/footwear: Comfortable shoes, warm clothing. Special clothing is provided. Please note: A valid driving licence must be presented. Available from 6th December - 15th May. The Russian Border – Just a few short miles of Kirkenes is the Russian border and can be the turning point of your Hurtigruten Voyage where you can visit Stoskog. In Stoskog you will see the Russian influence, and street signs will be in both Norwegian and Russian. You will not be aloud to cross the border but you can take in the incredible opportunity that this excursion offers, along with snapping a couple of pictures for your photo album. 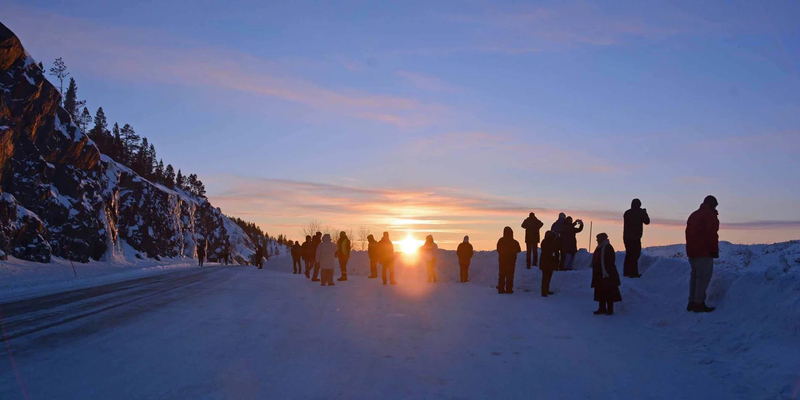 On your return to Kirkenes enjoy a guided tour. Clothes/footwear: Comfortable shoes, warm clothing. Kirkenes Snow Hotel – Discover a hotel built out of snow and ice in the idyllic Arctic surroundings near Gabba Reindeer Park. 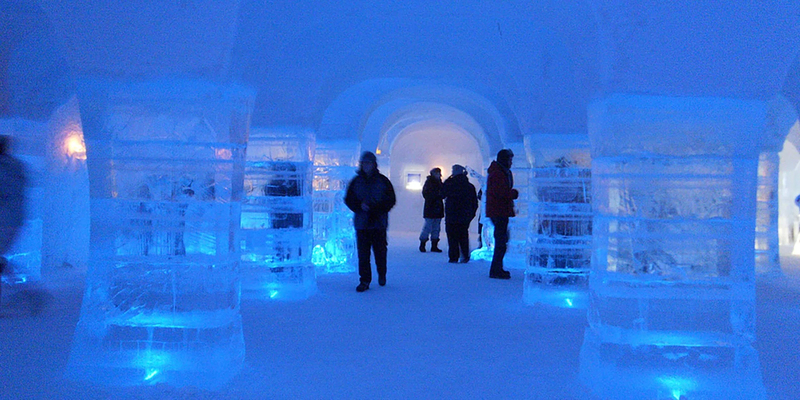 Your adventure will begin with a stroll up to the hotel and into the ice bar for a cherry shot. Enjoy a guided tour of the hotel and it's beautifully decorated suites. Later, gather around a cozy fire and enjoy a warm drink. There's also a dog yard you can visit to see some of the many huskies that live there. Please note: Excursion is subject to weather/snow conditions. 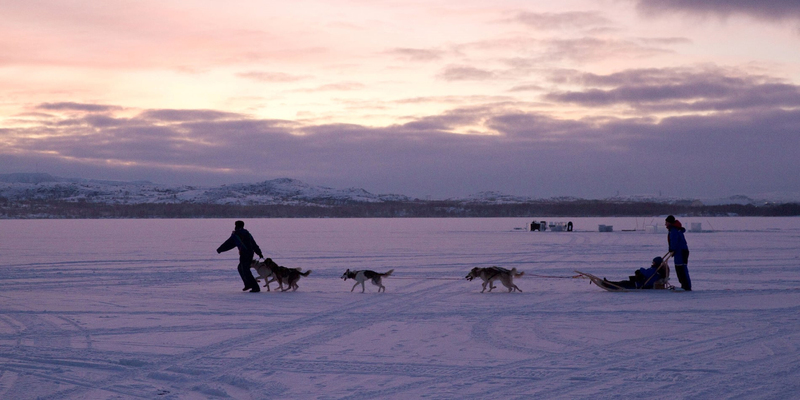 Husky Sledge Adventure – Experience a thrilling dogsledding adventure across the frozen Arctic Wilderness. Your attire will be provided for you and you will be taken care of with each sledge travelling with its own “musher” (guide). Your journey will follow the landscape of frozen landscapes and snowy plateaus. Clothes/footwear: Special clothing is provided. Experience Bodø and Saltstraumen – Join Hurtigruten for a coach tour of Bodø, where you will start with sightseeing through the second largest city in Norway. 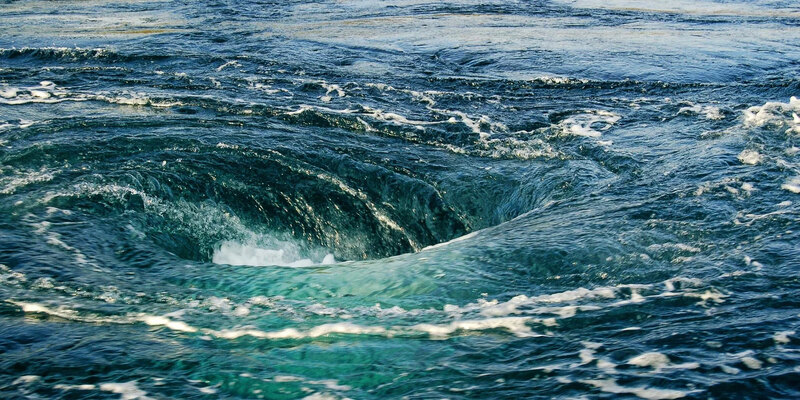 Later, drive six miles through awe-inspiring coastal landscapes to Saltstraumen, where you can get a close look at the strongest tidal current in the world, with water speeds reaching 22 knots. 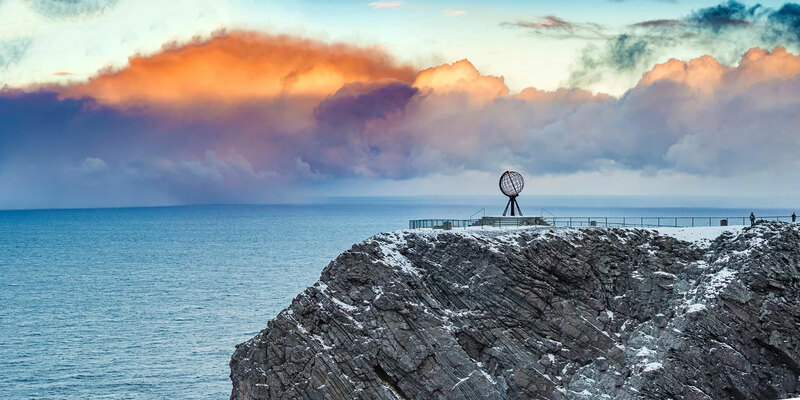 The North Cape – Embark on a scenic tour to North Cape, the northernmost point in Europe. On this excursion you will encounter magnificent landscapes of endless white plains, snow-capped mountains, dramtatic weather and the special light of the Arctic. Midnight Concert In The Arctic Cathedral, Tromsø – Day or night there’s so much that Tromsø has to offer. 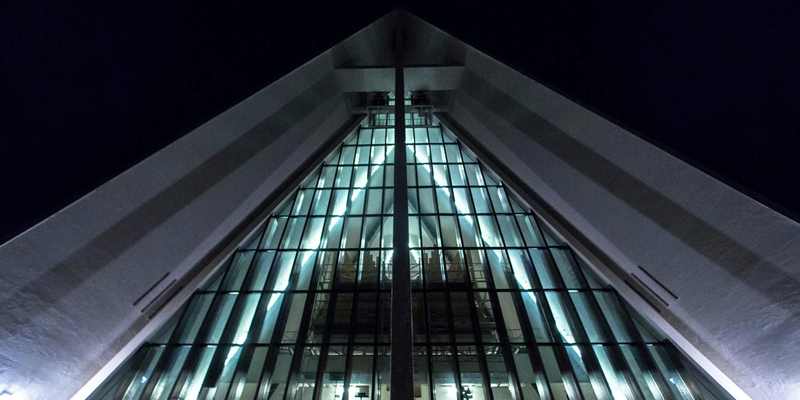 If you’re looking for something to do in the evening, attend a midnight concert at the city’s iconic Arctic Cathedral. The concert will offer a breath-taking musical experience with the Cathedral’s acoustics, along with folk songs and hymns that will be performed by professional musicians. Please note: No filming or photography is permitted during the concert. 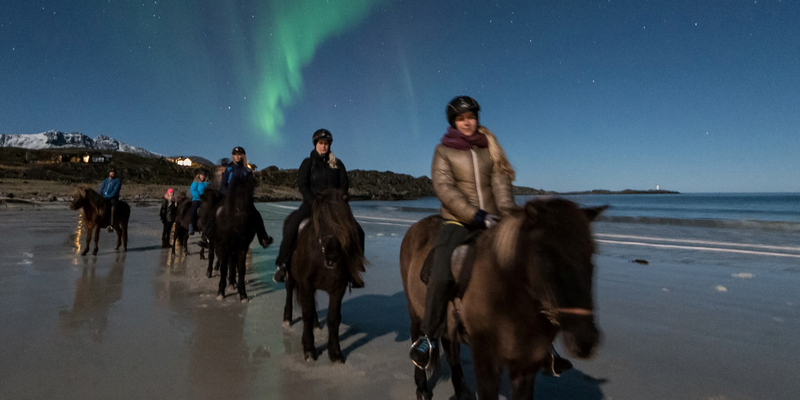 Lofoten by horse – Join the Hurtigruten expedition team on the shore of Gimsøy island and experience a horseback ride along a remote beach that was once inhabited by Vikings. This excursion offers a delight for several of your senses with breath-taking views and the calming ocean waves crashing against the shoreline. The above is just a selection of excursions that may be available when you travel and not alll excursions are available on all departure dates. If you would like to see a full guide to your Hurtigruten Northern Lights cruise and all the excursions, please click here. Please note excursions are available at a supplement, subject to availabilty, change and are weather permitted. Price of excursions are subject to change and may differ depending on departure date. 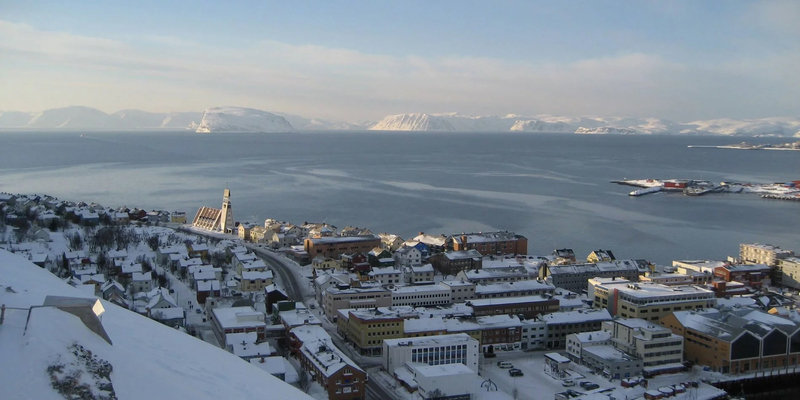 Not booked your Hurtigruten cruise?